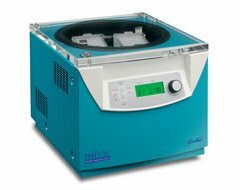 MiVac is a range of centrifugal vacuum concentrators and freeze driers capable of removing water and organic solvents from a variety of sample formats including tubes, micro-plates, and vials. Built-in specials optimise the concentration of water and water mixtures, improving performance and reducing time. The miVac SpeedTrap™ may now be used for freeze drying low volumes of water, and can be operated as a stand alone small volume freeze drier, or configured as a combined concentration / freeze drying workstation with a miVac vacuum concentrator. Choose from the miVac DNA Sample Concentrator for simple organic solvents, e.g. methanol, ethanol, and solvents up to 100°C BP, e.g. water, the miVac Duo Concentrator for low sample numbers or the miVac Quattro Sample Concentrator for larger numbers, the Duo and the Quattro are both available with the optional miVac SpeedTrap, Pressure Controller and pump(s). Both the SpeedTrap and the pumps (Duo Pump, Quattro Pump or Scroll) are also available separately.